Obituary – Thompson, Opal May (Wakeman) « Perry High School Alumni Association, Inc.
– daughter of Mr. and Mrs. S. O. Wakeman, was born December 3, 1918 in Perry, Oklahoma. She has attended Perry grade and High School and Braman, Oklahoma grade school. While a student of Perry she was a member of the National Honor Society, State Honor Society, and was Salutatorian of the Senior Class of 1936. She has been a member of the Perry Band, Orchestra and the Girls Glee Club. Following graduation she expects to attend A. and M. College at Stillwater to take an educational course. She is especially interested in becoming a teacher. Opal Wakeman Thompson, 99 years young, went to be with her Lord Thursday, February 1, 2018. Opal was born to Scott and Jessie Wakeman on a farm NW of Perry on December 3, 1918. She and Archer Thompson were married June 3, 1939. After his death in 1951 she married Herman (Tommy) Thompson May 9, 1953. She had been a resident of the Perry area all her life except for one year in Bramon, OK. She attended White school, five miles West of Perry for her first three grades. 5th-12th grades were with the Perry schools where she graduated, with honors, in 1936. She was employed by McClellans and for 17 years worked full and part-time for JC Penneys all during WWII. She was also a Shop Clerk at the State Highway Department for two years. 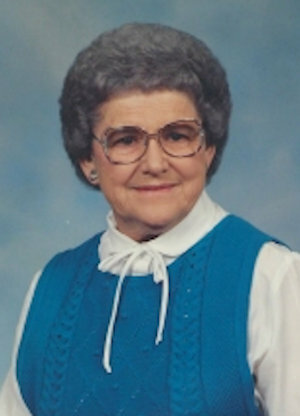 Opal was a lifetime member of the First Presbyterian Church. She also belonged to the Ester Rebekah Lodge since 1947 and a former member of Jolly Twelve Club and VFW auxiliary. Opal enjoyed life to the fullest, still mowing her lawn at age 95 and going to Lodge on Mondays. She loved camping, fishing, skiing and traveling in her younger years. She loved spending time with her family, especially the holidays. This must be shared – she was a very competitive dice player. On January 27th Opal was able to spend her last Christmas with all her family. A treasured memory for all. She wrote poems for friends and family and had one called “Presidents” that was published by the Poetry Guild. Many family members have been recipients of her beautiful crochet work down through the years. This past July Opal moved to Guthrie to live with her daughter. They spent most mornings watching the birds while having breakfast, her favorite – blueberry pancakes. Her 4 o’clock coffee and sweet snack was a daily occurrence. All who knew her will miss her wit and sweet smile. Survivors are daughter, Emma Jean Mouser, of Guthrie. Step daughter’s husband, Bill Smith, of Delaware, OK. Grandson, Jonathan Mouser and his wife Karen of Tulsa. Four great grandchildren: Kayleigh, Savahnna, Tommy and Cory. Several nieces and nephews and one great, great grandson, Kale Murrow. Sisters-in-law: Carol and Jim Daniel, Frankie and Maurice Howell, Ruth Thompson and Gwenethe Thompson. Preceding her in death were: her parents, both husbands, brother Clyde, sisters Edna, Faye and Helen. Son-in-law Willie Mouser, grandson Timothy Mouser and step daughter, Kathleen Smith. In lieu of flowers, contributions can be made to any Veteran organization. Celebration of life service will be held 10:30am Monday, February 5, 2018, at the Dighton – Marler Funeral Home Chapel in Perry. Visitation will be 1pm to 6pm Sunday, February 4, 2018 at Dighton- Marler Funeral Home of Perry.